Darlin’ I would send my love your way. 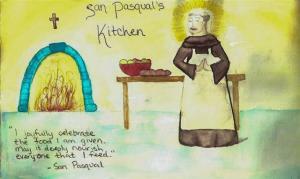 In celebration of the feast day of our beloved patron saint, San Pasqual, on May 17th, I made sopaipillas. Sopaipillas are a traditional dessert of fried dough found New Mexico. I first tasted them at a little Greek restaurant in downtown Santa Fe. These little treats were on every menu at all the restaurants we visited, and many times they were complementary. The little soft pillows of dough are drizzled with honey and served warm. Sopaipillas will make happy the heart of your true love and your children. Made with the simplest of ingredients, they come together with ease. It’s thrilling to see them puff up and soon as they hit the hot oil. This recipe is from the Santa Fe: School of Cooking Cookbook. I hope you give these a try and spread the love! Form into a ball and knead several times. Roll out the dough to an 1/8” thickness. Heat oil to 375º in a deep pan. Fry the dough ( 2 or 3 at a time at the most) turning often until golden. This should take place very quickly, about 30 seconds. Drain on paper towels. these look so delicious. i love the name of your blog.